We have experienced an unstable connection to our azure virtual ubuntu server for the last week. We are using pingdom and it's reporting that the site goes down randomly a few times per day, but only for a minute. 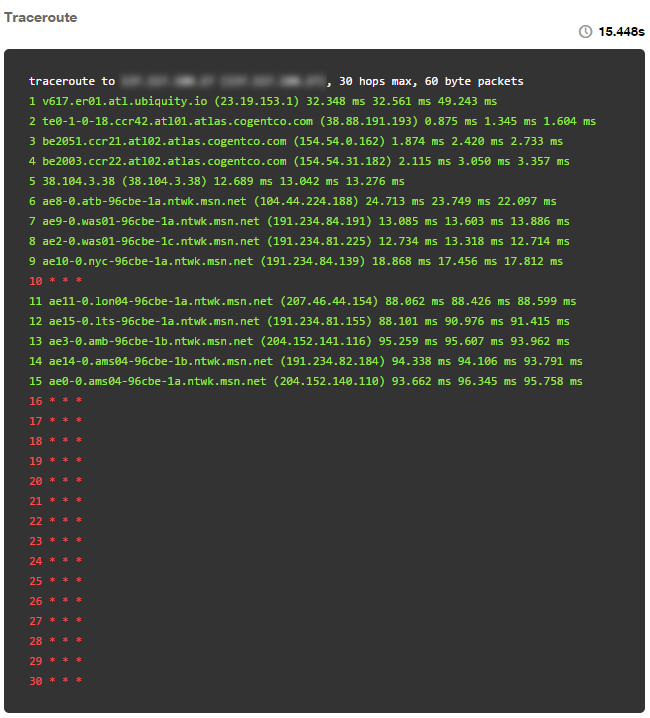 pingdom run's a traceroute when this happens (see attachment). Does anyone have any suggestions to what is happening here? The ip is correctly resolved. No NLB. I've seen similar issues before but with Windows Server hosts in Azure, whereby Remote Desktop connections were regularly being dropped across a number of VMs. In this scenario we were forming connections to the VM via a site 2 site VPN tunnel with the azure VNET gateway and so in our situation we traced the logs from the on premise firewall, to see if packets were being dropped from the on premise side. But again, something like Wireshark may help. But other than that, it may be time to log a support call with Azure. Not the answer you're looking for? Browse other questions tagged ubuntu networking virtual-machines azure or ask your own question.